The 3110 Low Country Elevation at 16379 Magnolia Grove Way offers 3511 square feet of living space w/ 4 Bedrooms, 3.5 Baths, Formal Dining Room, Study, Kitchen/Cafe, Family Room, 1st Floor Game Room (26x13), Upstairs Loft (16x11) and Covered Patio (35x10) on a lakefront home site. Available for Immediate Delivery at $249,900.00! Interior appointments include: * Ceramic Tile at Foyer, Gallery, Kitchen, Cafe, Family Room, Laundry and all Bathrooms * Granite Kitchen Countertops * 36" Kitchen Cabinets * GE Stainless Steel Appliances w/ Microwave vented to the exterior * Crown Molding in Main Living Areas * Vinyl Windows w/ Argon Gas Filled Low-E Glass * 2x6 exterior walls w/ R-21 Insulation * Hardie Lap Siding * R-38 Ceiling Insulation * Structured Home Wiring Package * And more! This home is 100% Energy Star Certified and rated for an estimated $146.67 monthly energy bill! For more information call Melissa Meide Matthews at 904-337-5236. 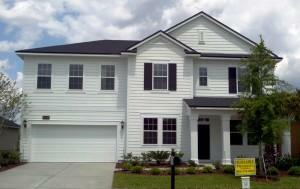 For more than 20 years, Providence Homes has been building well-crafted homes in the Jacksonville region. With a reputation for distinctive communities in the best locations, impeccable craftsmanship and a commitment to outstanding customer service, this extraordinary homebuilder strives to continually meet and exceed customer expectations. Providence Homes has grown from a one-man, home-based operation in 1992 to becoming one of the top 10 builders in the Jacksonville area, and one of the largest locally owned home builders. Bill Cellar and his team of 25 professionals have put together the very best talent dedicated to creating the finest homes at an exceptional value. Providence Homes believes that the most important element of your home is you. Their goal is to build every home with the same attention to detail and commitment to excellence as they would with their own family’s home.